Atas: Karipap menggunakan pastri biasa. Ia mudah, ringkas dan cepat. 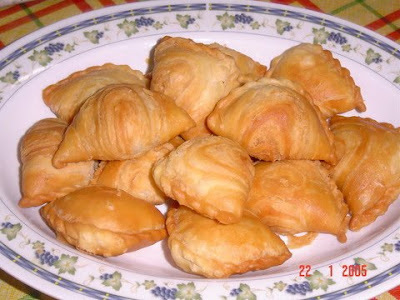 Mari kita cuba buat karipap mengikut resepi 50an. Bagaimana rasanya ye? Mungkin lebih enak dari karipap sekarang. Dalam buku masakan ini pastrinya adalah pastri karipap pusing. Cara membuatnya tidak begitu jelas, jadi anda harus mengolah resepi ini mengikut kemahiran anda. Jika nak cepat dan mudah guna saja ready-made puff pastry yang banyak di jual di pasaraya. beef, shrimp and continue stirring. Add potatoes and chopped onion, cover and cook until potato tender (add water if necessary). Add salt and turmeric. Stir and remove from heat. 1) Sift flour. Take 1/8 of the flour and mix with peanut oil and TREX oil (small portion) - dough 1. 2) Stir flour (balance from the 1st step) with peanut oil, TREX oil and enough water (mix with salt) until just mix, no kneading required - dough 2. 3) Wrap dough 1 into dough 2 to form a ball. Roll out the ball to 1 cm thickness and roll up to a shape of a log (like a swiss roll). 4) Cut log to 0.5 to 1cm thickness and roll to a small round pastry. Fill with the potato filling and fold the pastry. Trim the edge. Note: If you prefer more crispier and crunchy pastry, repeat process in step 3 twice or three times.